What if running the 26.2 miles of a marathon only felt like running 24.9 miles, or if you could improve your average running pace from 9:14 minutes/mile to 8:49 minutes/mile without weeks of training? Researchers at the Wyss Institute and John A. Paulson School of Engineering and Applied Sciences (SEAS) at Harvard University have demonstrated that a tethered soft exosuit can reduce the metabolic cost of running on a treadmill by 5.4 percent compared to not wearing the exosuit, bringing those dreams of high performance closer to reality. "Homo sapiens has evolved to become very good at distance running, but our results show that further improvements to this already extremely efficient system are possible,” says corresponding author Philippe Malcolm, Ph.D., former Postdoctoral Research Fellow at the Wyss Institute and SEAS, and now Assistant Professor at the University of Nebraska at Omaha, where he continues to collaborate on this work. The study appears in Science Robotics. Running is a naturally more costly form of movement than walking, so any attempt to reduce its strain on the body must impose a minimal additional burden. The soft exosuit technology developed in the lab of Wyss Core Faculty member Conor Walsh, Ph.D., represents an ideal platform for assisted running, as its textile-based design is lightweight and moves with the body. A team of scientists in Walsh’s lab led by Wyss Postdoctoral Fellow Giuk Lee, Ph.D. performed the study with an exosuit that incorporated flexible wires connecting apparel anchored to the back of the thigh and waist belt to an external actuation unit. 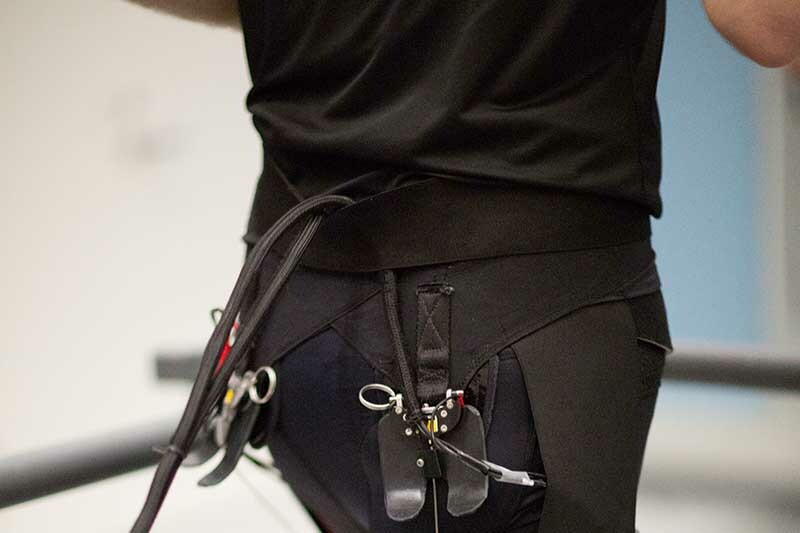 As subjects ran on a treadmill wearing the exosuit, the actuation unit pulled on the wires, which acted as a second pair of hip extensor muscles applying force to the legs with each stride. The metabolic cost was measured by analyzing the subjects’ oxygen consumption and carbon dioxide production while running. The team tested two different “assistance profiles,” or patterns of wire-pulling: one based on human biology that applied force starting at the point of maximum hip extension observed in normal running, and one based on a simulation of exoskeleton-assisted running from a group at Stanford University that applied force slightly later in the running stride and suggested that the optimal point to provide assistive force might not be the same as the biological norm. To clarify why applying force later in running stride improved metabolic expenditure so dramatically, the team analyzed what was happening to the subjects’ other joints when their hip joints were being assisted by the actuating wires. They found that the simulation-based profile also affected knee extension and the forces between the foot and the ground, while the biology-based profile did not. While the study’s results suggest that the increased biomechanical involvement of the simulation-based assistance profile is responsible for the reduction in metabolic cost, further biomechanical analyses are needed to confirm its findings. The team hopes to continue this research to reduce the metabolic cost of running even more. “We only tested two actuation profiles in this study, so it will be interesting to see how much more the cost of running can be reduced with further optimization of the system,” says Malcolm. “Our goal is to develop a portable system with a high power-to-weight ratio so that the benefit of using the suit greatly offsets the cost of wearing it. We believe this technology could augment the performance of recreational athletes and/or help with recovery after injury,” adds Lee. The days of a battery-powered exosuit for high-performance runners are still beyond the horizon, as the actuator unit (including motors, electronics, and power supply) in this study was off-board, but the authors say technology is moving toward making an untethered assistive exosuit possible in the near future. “This study is a great example of how our team can quickly leverage its experience and expertise in wearable technology and biomechanics to demonstrate how human performance can be improved in new application areas,” says Walsh.